Oskaloosa, Iowa (May 3, 1972) - What an evening of racing last night at the Southern Iowa Speedway in Oskaloosa. A pit full of beautiful, fast racing machines, a capacity crowd of race fans and rain threatening (just 31 miles away) really started the 1972 race season off flying. Don Hoffman of Des Moines captured the 20-lap super stock feature. 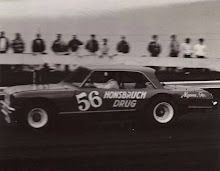 Hoffman, driving the new red 1972 Monte Carlo of Tom Spagnola, Inc., took the lead on about the fifteenth lap and held on for the victory. Don did some fancy driving to get thru the slower traffic and around a spinning John Moss to take over the lead spot. Moss of Iowa City seemed to have the race won (he led the first 14 laps), when he got caught in the slower traffic while lapping and was forced out of the race. Curt Hansen of Dike put his blue Ford into second place behind Hoffman. 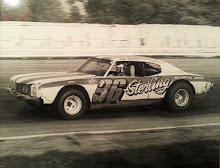 Bill Newman of Burlington was third in a Chevelle. 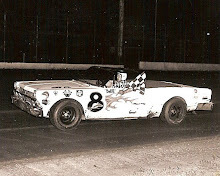 Right on Newman’s tail was Ed Sanger of Waterloo in a ‘70 Monte Carlo. Following in order were: Mike Niffenegger of Kalona, Bill Zwanziger of Waterloo, Randy Sterner of Blair, Nebraska, Bob Hilmer of Dysart and John Babb of Ottumwa. Bob Bonzer of Liscomb led all the way to win the first heat race. Bonzer was pushed hard all the way by Bill Newman. In a fight for third spot it was Randy Sterner of Blair, Neb., edging out Ottumwa’s John Babb. The red flag had to come out twice for minor spin outs before the official first lap. The drivers then settled into the groove and did some truly fine racing. John Moss topped the second heat ahead of Mike Niffenegger, Ed Sanger and Bob Hilmer. Moss was driving his new ‘70 Roadrunner. Curt Hansen jumped into the lead at the start and held on to win the third heat. Ron Perdock of Washington took second place with Roger Dolan of Lisbon in third. 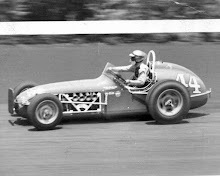 Earl Tice of Ames finished fourth. Hoffman, the only driver of the evening to win two races, also won the fourth heat. 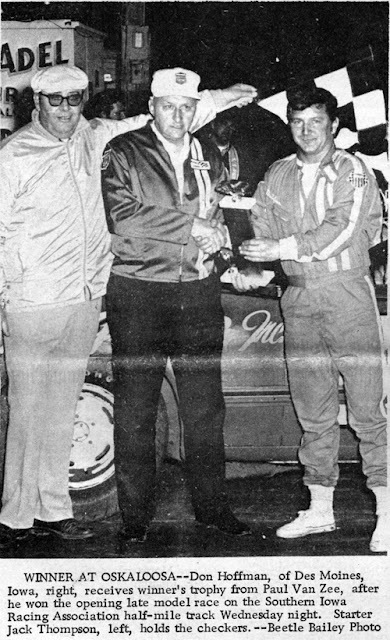 Hoffman, Bill Zwanziger, Pokey West of West Chester and Bill Martin of Council Bluffs had a side by side and bumper to bumper battle for that first place throughout much of the 8 laps. They finished in the above order. Dan Clement of Rhodes won the 10-lap semi-main by a wide margin over the rest of the 19-car field. Bill Beckman of Lisbon finished second followed by Red Dralle of Cedar Falls, Chris Maurer of Colfax, Joe Merrifield of Des Moines, Mike Keen of Marshalltown and Bob McCall of Ottumwa. With such a large field of super stocks the Australian pursuit was dropped in favor of an extra heat race. Larry Angell of Des Moines captured the Sportsman feature race. Angell took over the lead midway through the race and held on to win. 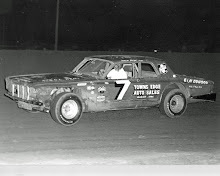 Kenny Grimm of Cedar Rapids was leading by a large margin but had some tough luck when on the sixth lap the left rear wheel and axle pulled out and went down the front stretch ahead of him. David Foster of New Sharon placed second. Official finish was third, Kenny Grimm; fourth place Paul Lamphier of Oskaloosa and David Schrader of Monroe in fifth.